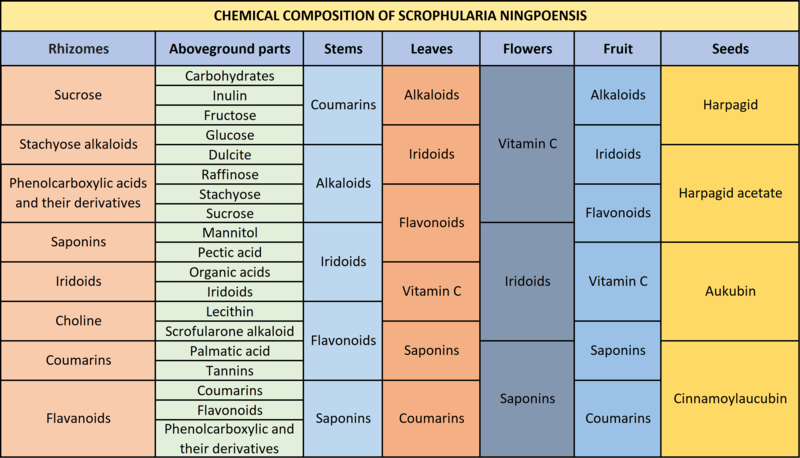 BOTANICAL INFORMATION: The genus Scrophularia of the family Scrophulariaceae consists of about 300 species of herbaceous flowering plants known as figwort. All the Species of Scrophularia share square stems, opposite leaves and open two-lipped flowers forming clusters at the end of their stems. PHARMALOGICAL PROPERTIES: anti-inflammatory, anticonvulsant, sedative, wound healing, urinary and diaphoretic, anthelmintic, dermatological, laxative, vomiting and other qualities. 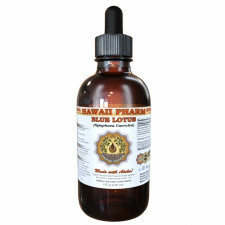 What is more, tincture stimulates the contractile activity of the uterus. Ningp is mostly used in traditional medicine nowadays to treat many diseases. It helps to reduce joints pain, it boosts the immune system, it improves heart function, it lowers blood sugar, it protects from fungal infections. Ningpo figwort is very effective in curing skin diseases such as eczema, psoriasis, ulcers and warts. A decoction of rhizomes is used as an anti-inflammatory for itching dermatosis, lymphadenitis, furunculosis and hemorrhoids. In a cut or shredded form for the treatment of tumors, suppurations and snake bites. Juice of Ningpo figwort is used to cure cancer, tuberculosis of the lungs, ulcers and infiltrates. Infusion of leaves is highly used to heal scabies, ringworm, purulent wound and condyloma. A decoction is also used in case of thyroid disease, tumors, infectious diseases as well as an antidote for the bites of rabid animals. 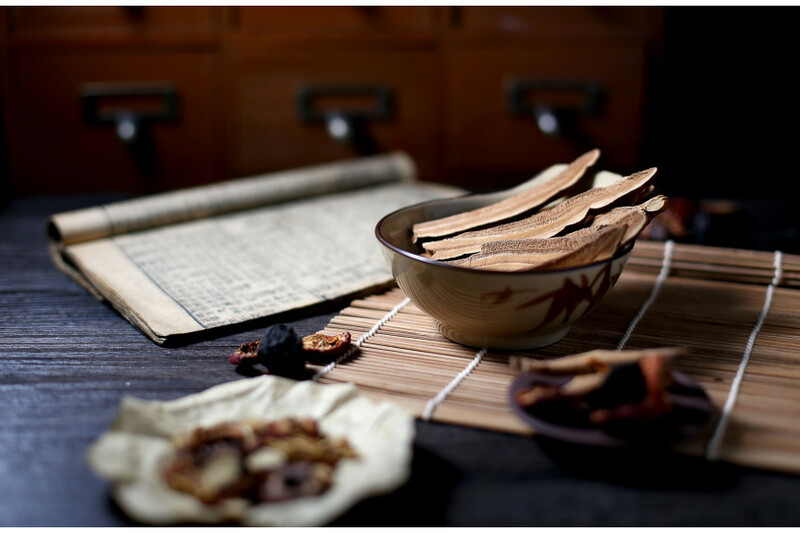 A decoction and infusion of Ningpo figwort promotes treatment for kidney disease, nervous diseases, headache and lumbago. Don`t use together with ginger and astragalus. Avoid using it if you suffer from diarrhea, abdominal pain or dizziness. Be aware not to use Ningpo figwort together with Antidiabetic medications, as it may cancel or worsen the effect of this herb. Remember that the use of Ningpo figwort may cause bloating. Herb infusion: Pour 1-cup boiling water over 1/2 tsp. chopped dry grass, insist 2 h then drain. Take 1-2 tbsp.3-4 times a day if you suffer from insomnia. Application from the leaves: Apply powdered leaves of Scrophularia ningpoensis to the affected areas of the skin in case of eczema. The name “Ningpoenis” comes from the name of the disease “noritsa” - this was the name used for ulceration of the withers of horses, which were treated with this herb. People compared the look of the herb with gland tumors and considered Scrophularia ningpoensis to be an anti-mumps drug. It was believed that Scrophularia ningpoensis worn on the neck keeps the person healthy and protects him from the evil eye. *Be sure to follow relevant directions on product labels and consult your pharmacist or physician or other healthcare professional before using.